Please note that the content of this book primarily consists of articles available from Wikipedia or other free sources online. 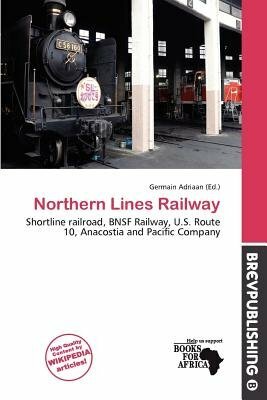 Northern Lines Railway is a shortline railroad operating 25 miles (40 km) of track in and near St. Cloud in central Minnesota. The railroad was formed in 2004 to operate former Burlington Northern Santa Fe trackage in the St. Cloud area. Interchange is made with BNSF in east St. Cloud. The railroad operates three connected lines. The St. Joseph branch extends from the connection with BNSF in east St. Cloud westward, crosses the Mississippi River on the 1892 St. Cloud Rail Bridge and continues on to St. Joseph, approximately 7 miles (11 km). The Cold Spring branch extends southwestward from its connection with the St. Joseph branch line in west St. Cloud, passing through Waite Park and Rockville and terminating just west of Cold Spring, approximately 15 miles (24 km).